The facts of the case began unfolding in 2009, when plaintiff’s late wife noticed a large mass had begun to develop on the back of her head. Her primary care doctor determined it was a tumor and referred her to a neurosurgeon. The doctor did not order a biopsy of the tumor to ascertain whether it was cancerous, but went ahead with a diagnosis of osteosarcoma, a type of bone cancer. Several imaging results of the tumor showed it had already begun to invade her skull, and would soon be creating pressure on her brain. Immediate surgery was ordered to at least remove some of the tumor’s mass, which would not only help to alleviate the risk of brain pressure but also make the tumor more treatable through other means, such as chemotherapy and radiation. The neurosurgeon directed the patient’s primary care physician to order numerous tests to make sure she’d be fit to undergo surgery. Two of those tests included an electrocardiogram and a urinalysis, and results for both were included in patient’s chart. Unfortunately, the readout that was included in the chart was a copy of a copy. The quality of the image was poor. However, the EKG machine’s interpretations did red flag abnormal results, indicating she may have unknowingly suffered two prior heart attacks and/or could have an enlarged heart. Further, the urinalysis results were abnormal also, with an abnormal protein level indicating proteinuria, a sign of potential kidney failure. Both of these could indicate she was not medically fit to undergo such a serious surgery. Nonetheless, she was cleared by her primary care physician. She arrived for surgery and was prepped. Defendant anesthesiologist was at the hospital attending to a different patient and was not assigned to her, but because his colleague was running late and her pre-anesthesia hadn’t yet been conducted, he decided to do the pre-anesthesia evaluation. When he introduced himself, he stated outright he would not be patient’s anesthesiologist, but continued with pre-surgical screening, asking a series of medical questions and reviewing some (but admittedly not all) of her medical chart. He would later say he did read the EKG, and while it was blurry, there was enough clarity for him to determine her heart was normally functioning, and he attributed the abnormal result to a malfunctioning EKG machine. He hadn’t seen the page indicating the proteinuria, but said even though it’s something he’d want to know, it wouldn’t have affected his determination that the patient was safe to undergo surgery. Once the other anesthesiologist arrived, he too conducted a pre-surgical evaluation, saw the abnormal EKS and also urine results, but did not red flag it. Neither anesthesiologist informed the surgeon of these results. During surgery, patient began losing a lot of blood, experienced a sharp drop in blood pressure, went into cardiac arrest and could not be revived. An autopsy showed the tumor was not osteosarcoma, bur rather a type of plasma cell cancer called multiple myeloma, also known as Kahler’s disease. Plaintiff, patient’s widower, filed medical malpractice claims against every physician involved, including the first anesthesiologist who read her chart. He alleged her death was caused by failure to diagnose her cancer – multiple times – resulted in her death because radiation and chemotherapy were the only accepted treatments for her condition. 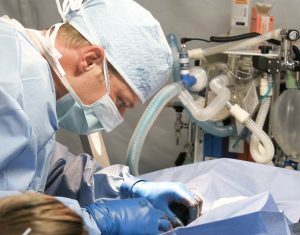 Specifically with regard to the first anesthesiologist, plaintiff alleged he breached the medical standard of care when he failed to review all available data in her chart, failed to order a second EKG to reconcile the abnormal results of the first and failed to report the abnormal lab results (some of which he never even looked at) to her surgeons. Had he done so, plaintiff asserted, either he or the surgeons would have realized patient had a different condition than the one originally diagnosed and the surgery would have been canceled. Trial court gave a directed verdict with regard to the first anesthesiologist, finding that even in assuming he was negligent, he was “nothing more than the cab driver who drove (patient) to the hospital.” No competent substantial evidence existed to conclude he was the primary cause of patient’s death. The appellate court affirmed. In its reversal of the medical malpractice directed verdict, the Florida Supreme Court ruled, “the law does not require the act to be the exclusive or even the primary cause of an injury for that act to be considered the proximate cause of the injury.” Instead, as our Naples medical malpractice attorneys know too, it need only be a substantial cause of the injury. The court noted that to preclude the liability of an initial negligent actor, the intervening cause has to be independent of and not set in motion by the initial wrong. That was not the case here, and the court reversed. In other words, a treating physician can’t preclude himself or herself from liability for Florida medical malpractice just because another treating physician says adequate care by the first doctor wouldn’t have altered any of the subsequent care. If that wasn’t the case, there would be no need to analyze the behavior of each doctor individually. If you have a complex medical malpractice claim alleging misdiagnosis, missed diagnosis or error at any point in the diagnostic process, contact our dedicated Naples medical malpractice attorneys to learn more about your legal options.